I am trying to determine if there is a spanish translation of the New King James available in Logos 4 Mac. I cannot seem to find it on the site or through my home page. if it is available, how do I purchase and download? I don't understand your question. The New King James is an English translation of the original Greek and Hebrew. If you want a Spanish version why would you want a translation of a translation? Just get a Spanish translation. Well that's different than a Spanish translation of the NKJV, that's a Spanish translation AND the NKJV. !La edicion ideal para personas que estan descubriendo un segundo idioma con las Escrituras! La Biblia bilingue, version Reina Valera 1960, te ayudara a examinar y a discernir la Palabra de Dios con dos idiomas lado a lado. Es ideal para usar en comunicacion con personas que hablan otro idioma. Esta Biblia promete ser facil de leer y entender al ir estudiando las Escrituras de una manera nueva y directa. Esta disenada para alcanzar a la nueva generacion con un lenguaje facil de entender. Le provee al lector las herramientas esenciales para el estudio y el discipulado. Gregory ... in Logos, a Bilingual Bible isn't really needed, since it's easiest enough to simply put an english version (NKJV) in one window, and a spanish version next to it, and then hook them together so they scroll together as you read. Even better, you can do bilingual AND hook a spanish commentary up (and an english one too!). The software is very flexible. So for example, if you bought both of these, you'd have the bilingual version (along with many more you can add)! The software itself is free; you just buy the books (or you can also buy spanish packages at a reduced price). Thanks, I have the NKJV in my LOGOS. I have the Bible Study Level Logos 4 Mac. In looking at the list of Bibles, I do not see a spanish translation. Do I need to purchase it? Or, is it already there for access? If so, how do I find that in Help? Also do you have a link in Help for forum for hooking two translations? That is above my pay grade, I guess. Do I need to purchase it? Yes. You might want to call Logos Sales. There are Spanish collections that will have Spanish Bibles. That may be the least expensive way to go, especially if you might use any other Spanish resources. Here is a list of Spanish Collections from Logos. There is also a Logos forum in Spanish. I teach qualitative research at SETECA in Guatemala City, so found you initial query of interest. There is not a version in Spanish translated from English that I know of (and I hope there isn't...that would be foolish). But the RVR is generally recognized as the Spanish equivalent to the KJV. The RVR1960 or RVR1995 might be then the NKJV equivalent. looked like the Catholic version wasn't really the same. Toda herramienta que fuere fabricada contra ti, no prosperará; y tú condenarás toda lengua que se levantare contra ti en juicio. Esta es la heredad de los siervos de Jehová, y su justicia de por mí, dijo Jehová. "The RVG is a revision of the Reina Valera Spanish Bible using the Hebrew Masoretic text, the Greek Textus Receptus, and the King James Version with collaboration from a great host of Spanish speaking pastors from seven different countries. 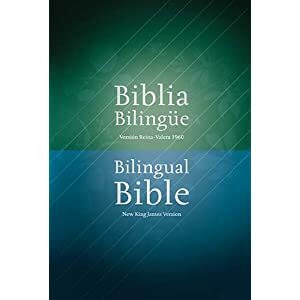 This definitive revision retains both the beauty of the Spanish language and the accuracy of the English King James Version." I grimace when reading the description. I hope you're grimacing due to the amount of debate behind the RVG. Rumors of Westcott! Could it be? Rumors of Westcott! Could it be? If so, it would probably bring cheer to the face of Erasmus ... as an avant-garde scholar he's likely mortified by the coronation of his work.